Chemoautotrophic bacteria get their energy from oxidizing inorganic compounds. In other words, instead of using the energy of photons from the sun, they break the chemical bonds of substances that don’t contain carbon in order to get their energy. Some of the inorganic chemicals chemoautotrophic bacteria use are hydrogen sulfide, ammonia and iron. For example, the sulfur-eating bacteria Thiothrix oxidizes hydrogen sulfide to produce water and sulfur. The energy that is stored in the chemical bonds of the hydrogen sulfide molecule is released during the reaction. The bacteria use this energy along with carbon dioxide to make sugars and carbohydrates. Chemoautotrophic bacteria often live in extreme environments like deep sea vents in the ocean, hence their other name, extremophiles. 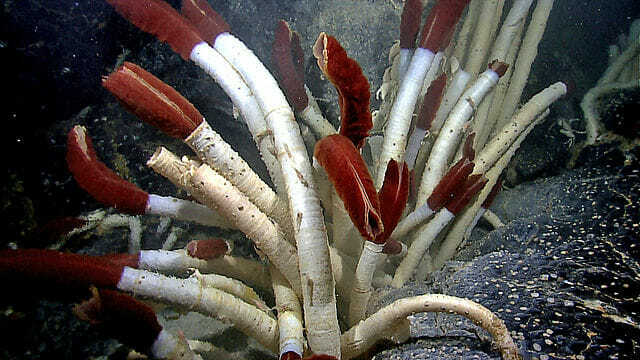 The image above shows giant tube worms, Riftia pachyptila, that live near hot sulfur vents in the ocean. Chemoautotrophic bacteria live in a symbiotic relationship with these worms which have no digestive tract, making organic molecules for the worms from hydrogen sulfide, carbon dioxide and oxygen. In return for this, the worms supply a special type of hemoglobin they make as food for the bacteria.